Have you been contemplating to enjoy a luxurious and stylish ride? Our 24 hour Limo service in Los Angeles could just be the best pick. Though finding the right Limo service could be a little tough but with a reliable provider, you would surely get a purely delightful experience. At Airport ASAP, we have an absolutely uncompromising attitude and can offer the finest Limo drive that you can only dream of. Certainly, it’s not always practically possible to get a Limo service like ours; hence we present a few key pointers here, following which would help you have a wise selection. Consider the event – It would be great if you take into account the event that you need it for. Basically, Limo services quotes prices according to the events thus it is important to have a clear set idea about the event before booking the ride with Limousine. The fact is Limos are customized as per the occasion and event and they offer discounts basing upon that. The airport is a 24 hour Limo service in Los Angeles and can be fully trusted upon for all kinds of events. So, when you think of a Limo drive in LA, do not hesitate to consult us. Be aware of the hourly charges – A good choice of Limo can be determined with your clarity about the hours that you want it till. A slight ambiguity in this could leave you with a costly expenditure simply because generally the Limo providers charges on an hourly basis. So, in short, be sure as to for how long you need its service and pay accordingly as per your budget. Check the number of companions – It is quite crucial to consider the number of travel companions you have with you when thinking of hiring a 24 hour Limo service in Los Angeles. There are some Limos which can accommodate four to five passengers whereas there are some which can put up with 20 people at the same time. So, it is better to be clear about the number of your co-travellers when you book a Limousine. Rest assured we at Airport ASAP have the best Limousine to offer which can easily take the maximum number of people. Our 24 hour Limo service in Los Angeles is certainly worth considering. Open a corporate account – Corporate account helps business travellers to have an affordable service of Limousine during their travel requirement in and around the city. Airport ASAP is one of the most credible 24 hour Limo services in Los Angeles and holds proficiency over offering an efficient deal with it. With us, you can be sure to save up to 20% on our high-end Limousine services. We basically offer a professional executive airport service and corporate transportation accounts. Round the clock service provider- One of the most vital points to know when you book a Limo ride is to have a service that could come handy at every hour of the day. 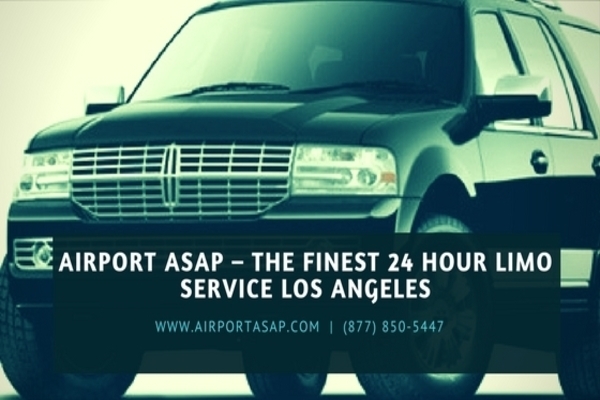 In a nutshell, 24-hour service is what you should be looking for and with us, Airport ASAP, you can be absolutely sure about having the best 24 Hour Limo Service in Los Angeles. Share details in advance – Sharing details about your travel plans with the Limo service provider would ease off your journey in a great way. Talk about the routes and the pickups and drop and to boot all your plans including your smoke breaks in between to let them exactly provide you with the service you want. Undoubtedly Airport ASAP can turn out to be an amazing choice for a convenient Limo drive.